Readers will not get doom and gloom from my astrology forecasts. I don’t believe in being an alarmist. It isn’t very useful. The world hasn’t ended yet even though the end has been foretold many times. I like astrology because it helps me connect to a mysterious and engaging cosmos. If astrology isn’t about choice and co-creation, then I don’t want it. No doom and gloom from me. However, I can’t help noticing what interesting times are coming our way over the next two years. We have a huge opportunity to participate in the coming changes by living lives that support the changes we want to see happen. With that thought in mind, it may be helpful for those of you who are fully participating in co-creating the Multiverse in conscious and brilliant ways, to know a few things that strike me as interesting about this month and the next year or so. The New Moon on Jan. 4 is also a Solar Eclipse at 13 degrees Capricorn—exactly opposite the U.S. Sibley Sun. 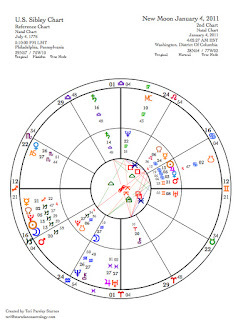 There are several birth charts for the United States. I use one that is known as the Sibley chart. 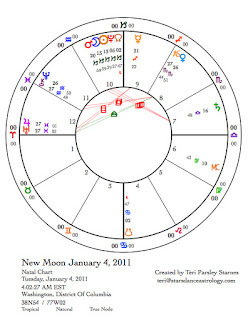 [See the bi-wheel that represents the Sibley chart and current transits at the New Moon.] Eclipses to the Sun signal a reorientation of focus. The light goes out, and for a time, direction and purpose can be lost as well. However, the light returns, sometimes placing us on new, unforeseen paths. I wonder if we will experience something like this as a nation over the next few months? This eclipse opposite the nation’s Sun is not the only influence of the moment. In fact, it may be the least significant one. Pluto represents both corruption of power and the transforming use of power. In Capricorn since 2008, Pluto shows us where our hierarchies are dysfunctional. There is potential to reorganize how we handle the most basic survival issues. At this moment, Pluto is opposite the nation’s Jupiter in Cancer. Jupiter is an important guide for the country; this planet rules the Sibley chart. This Jupiter represents the national character of optimism, patriotism, even being a vanguard for freedom, although there may be a bit too much myth in this persona and not enough actual expression. Pluto takes the blinders off and exposes who we really are. The result could be a revitalization of national identity if we can accept reality. Neptune represents the collective imagination—from the illusions that confuse us to the inspirations that guide us. Now, Neptune is transiting the exact degree of the nation’s Moon. The Moon represents the people in a nation’s chart. Have we been living in fantasy? During a Neptune transit, more goes on in the unconscious than in conscious awareness. Neptune is now moving away from this point after being there for the past year. I wonder what collective thoughts will be as we wake from this dream? Expression of dreams is a theme for the next 14 years as Neptune moves into Pisces in April. Uranus represents revolution—the impulse to change and innovate. After being in Pisces for the last 7 years, Uranus also changes signs in March, moving into a very impulsive fire sign, Aries. 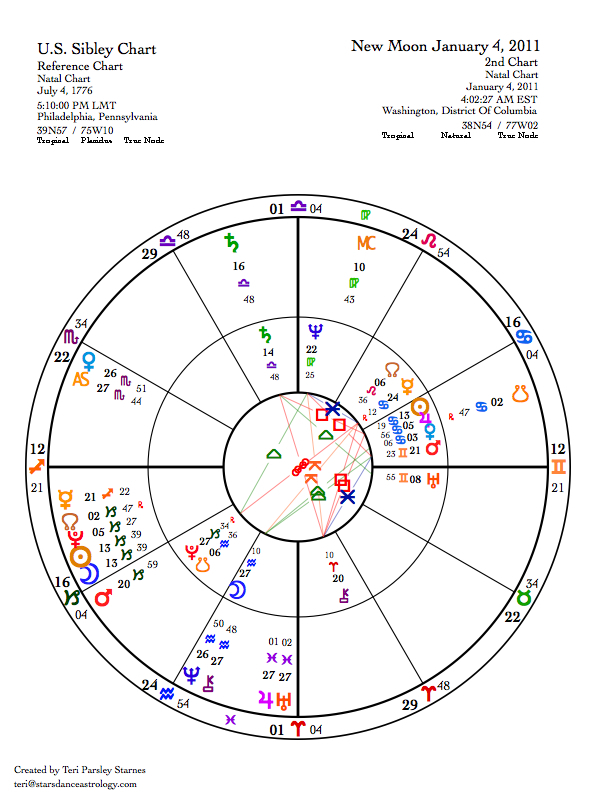 But first, at this New Moon Uranus and Jupiter are co-joined at the end of Pisces while transiting an important dynamic in our nation’s chart: Neptune square Mars. This quality in the U.S. natal chart points to the fantasies we have around aggression and war. This transit from Uranus began in 2008. As it ends, there is potential to give up on war fantasies. However, since Uranus will be transiting into a more aggressive sign, there is a danger of more aggression. This is where personal intention to work with anger and finding solutions to conflict may help to influence others to choose peace over war. Individually, we are important. Saturn represents our authority—where we have hard yet significant work to do. We are experiencing a Saturn Return this year, which happens every 30 years. At the New Moon, Saturn is at 16 degrees Libra, only two degrees from the “natal” position of 14 Libra at the birth of the U.S. We gain authority through diplomacy, since Libra is the sign of the peacemaker. The national chart shows Saturn—the authority of diplomacy—square to the Sun in Cancer—striving to protect homeland. Protectionism vs. the work of engaging in world relationships has been an important dynamic of our nation’s history. Interestingly enough, the exposure of diplomatic secrets from Wikileaks may be part of our reorientation towards being a more prominent force in the diplomatic world. As far as major transits go for this year, Jupiter reentering Aries this month and staying until June when it moves into Taurus for a year, contributes to the same impulsive energy discussed with Uranus. On the plus side, we will have the energy we need to take action. For the first half of the year, we will initiate new actions, especially on behalf of asserting who we really are. When Jupiter moves into Taurus, the focus will be on sustaining any changes we have begun. 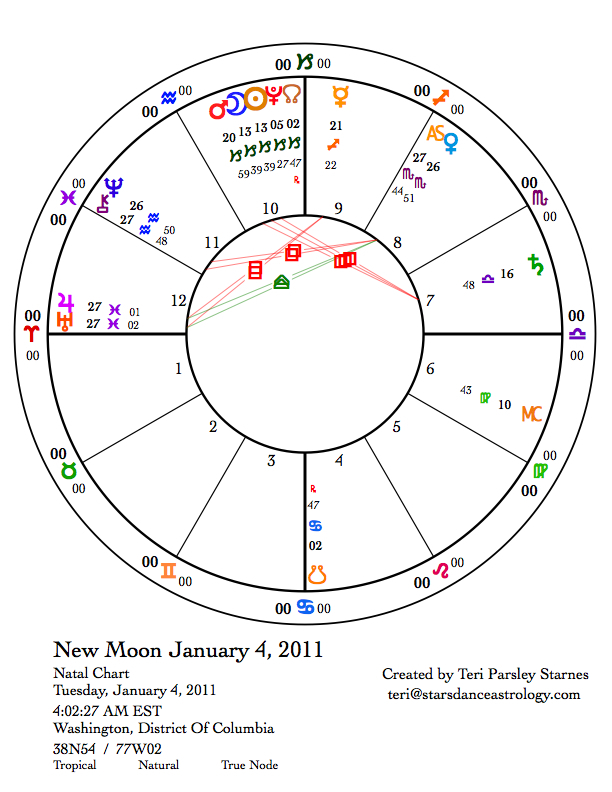 Looking ahead to the next major development in the cosmic cycles, in 2012 Uranus in Aries will square Pluto in Capricorn. This is the first opening square since these two revolutionary planets came together in the 1960s. There is good reason to believe that the choices we make this year will significantly impact the story of changing culture that is sure to emerge more strongly when the square between these two planets becomes exact. A hopeful message. On Dec. 30, the New York Times published an article about a young, ingenious designer named Yves Behar [Yves Behar of Fuseproject on Design with Grand Ambitions] that inspired me. I like this realism that is also bringing forth beauty. Perhaps we can take inspiration from the idea that we are on the verge of new, pragmatic, yet beautiful solutions to the very real problems facing us. We’ve been waiting for this moment to step forward with brilliance and creativity. In what ways will you dare to be a conscious co-creator of this present moment? How will you contribute? January is a time when we make plans for the year. How will you embrace the challenges before us? What is your plan?